After we finished our bike tour of the Cu Chi Tunnels we headed to the Airport for our flight to Siem Reap. Before we left for Asia, I made sure to get a few extra passport photos taken, since we would need them for the visas in Cambodia. Well, as luck would have it, I couldn’t find my extra photos anywhere — and I didn’t realize this until we had arrived at the Ho Chi Minh Airport. Interestingly enough, there wasn’t a single place to get a last minute passport photo taken at the airport. I figured I’d roll the dice and see what happened once I landed in Siem Reap – I figured the worst that would happen is they would deny my entry and I’d be shipped back to Vietnam on the next flight (which would have been fine since I had a multiple entry visa to Vietnam). We always allow a little extra airport time when traveling in unfamiliar airports or in less than developed countries – you never know what kind of mayhem will ensue. Luckily, we were through check-in, immigration and security in no time flat – allowing us more time to explore the Ho Chi Minh Airport. There isn’t much to do in the airport – but there was a Priority Pass Lounge that I decided to visit. 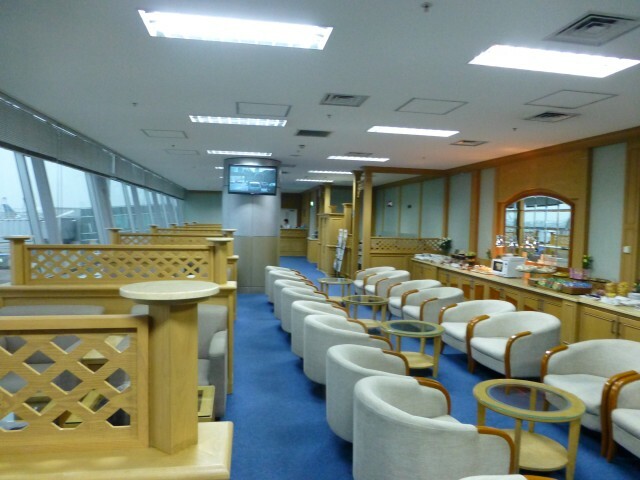 Much like the mediocre lounge in Shanghai this lounge was a real throwback to poor design of the 1980s. There was some cold sandwiches, self serve drinks (both soft drinks and alcoholic) along with some hot soups and packaged goods. The lounge was nearly empty, save for the couple of Australian tourists who were drinking their weight in local beer and speaking at the top of their lungs. Suffice it to say that I spent enough time in the lounge to grab a beer, some potato chips and get the hell out. Like in Hanoi, Vietnam Airline announced boarding by groups, but that really didn’t impact who boarded and when they boarded. It pretty much was a free for all once the door to the jet bridge opened. The flight was about half full and most of the other passengers were tourists as well – European and Australian. Siem Reap isn’t really a hotbed for business travel – that’s for sure. I am glad we sat in the front of the economy cabin as I wanted to make sure I was one of the first people through immigration so if I had visa issues we could get them resolved quickly (and if I had to stand in another line, I’d be in the front of that line). The flight attendants were very efficient – managing to serve us a full tray plated evening snack and beverage in the 58 minute flying time. Kudos to efficient non-American airlines! 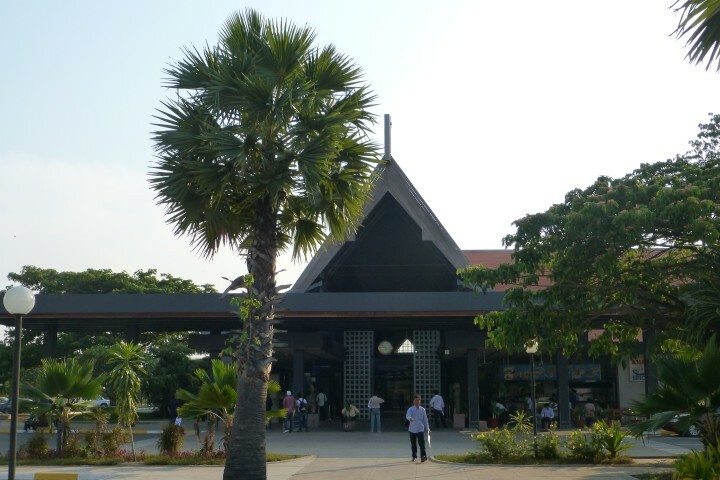 The Siem Reap Airport is an open air facility which was built to resemble the temples of Angkor Wat. The picture above was taken when we left Siem Reap (we landed after dark and my photos were less than ideal). I had no issues in immigration – since I didn’t have the requisite passport photo they just scanned my photo from my passport and used that. A surprisingly modern solution. We were traveling with a couple who had pre-purchased their visas and just had to collect them from the designated area — they were through with the immigration process marginally quicker than we were. They were seated much farther back in the plane than we were. I think the pre-purchase visa option makes a lot of sense purely from a timing point of view. We headed off to collect our baggage and as we entered the arrivals area we were greeted by our guide – who a friend had recommended and we had booked just 2 days earlier. I won’t post his full contact information here, but if you are planning a trip to Siem Reap let me know and I will put you two in touch. He did a good job, which you’ll read about more fully in an upcoming blog post. By Tim in Travel on January 2, 2014 .